This is my 2nd installment of Basic ECG Concepts. Rather than specific cases — the goal of these Basic ECG Concepts is concise review of some less advanced topics that comprise the fundamentals of ECG interpretation. This material is excerpted with modification from my new introductory book to ECG Interpretation = “A 1st Book on ECGs-2014” and the expanded 1st-ECG-Book-ePub version (which is out in kindle-nook-kobo-ibooks). Your feedback on this series is WELCOME! Point #1: Start with Descriptive Analysis — in which you sequentially assess the following 6 Parameters: i) Rate; ii) Rhythm; iii) Intervals; iv) Axis; v) Chamber Enlargement; and vi) QRST Changes. There is no interpretation in this initial step. Instead — one simply makes note of the ECG findings that are seen. Point #2: It is only after you complete Descriptive Analysis — that you should formulate your Clinical Impression. This is the time to integrate the ECG findings you noted into context with the clinical scenario. For example — even marked concave up ST elevation is unlikely to indicate infarction IF there are no reciprocal ST changes and the patient is a young adult with non-concerning symptoms. In contrast — an early STEMI might need to be strongly considered if the same ECG was obtained from an older patient with worrisome chest pain. Point #3: Regardless of whatever system you favor for your systematic interpretation — Look at INTERVALS at an early phase in the process (See below). There are 3 ECG Intervals to assess on each and every ECG you encounter = i) The PR Interval; ii) QRS duration; and iii) The QT Interval (Figure-1). The reason it is essential to assess Intervals at an early point in the process — is that IF the QRS complex is prolonged, we then need to determine WHY the QRS is wide before proceeding with our interpretation. This is because criteria for evaluating axis, chamber enlargement, ischemia and infarction all change when there is BBB (Bundle Branch Block). The PR Interval — is the time for the impulse to travel from the SA Node to and through the AV Node. On the ECG — this interval is defined as the amount of time measured from the onset of the P wave — until the onset of the QRS complex (Figure-1). The QRS Interval — is the time to get through the ventricles (ie, the time it takes for the impulse to travel from Point 2-thru-Point 5 in Figure-1). Although referred to as an “interval” — we are really describing the width (duration) of the QRS complex. 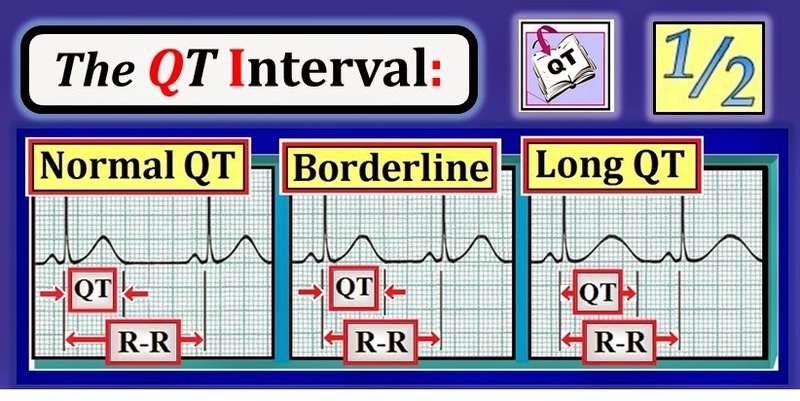 The QT Interval — corresponds to the period that extends from the onset of the QRS complex until the end of the T wave. Figure-1: The 3 ECG Intervals. With normal Sinus Rhythm — the impulse begins in the SA Node — is conducted through the atria over specialized pathways (1 in the right-hand Figure) — before arriving at the AV Node. After the impulse traverses and exits the AV Node — it enters the Bundle of His (= 2 in the right-hand Figure) — which divides into the Right and Left Bundle Branches (= 3,4). The impulse finally reaches the extensive Purkinje Fiber Network that stimulates heart muscle to contract (5). The PR interval (from onset of the P wave until onset of the QRS) — encompasses the amount of time for the impulse to travel from the SA Node to (and through) the AV Node. The QRS interval (= QRS duration) — encompasses the amount of time from the onset of ventricular depolarization until all of the heart has been activated (= 2-thru-5). The QT interval — is the time from onset of the QRS until the end of the T wave (Figure reproduced from A 1st Book on ECGs-2014-ePub ). NOTE — Enlarge by clicking on Figures — Right-Click to open in a separate window. KEY Point: Travel through individual myocardial cells is slow. The purpose of the Conduction System that is schematically shown in Figure-1 is twofold: i) It greatly speeds up conduction (which is at least 100 times faster than conduction over individual myocardial cells); and ii) It coordinates ventricular systole (so that left and right ventricular contraction is coordinated) — which optimizes the heart’s efficiency in pumping blood. Each large box on ECG grid paper takes 0.20 second (1/5 of a second) to record. Therefore — it takes 1 second to record 5 large boxes. Each small box on ECG grid paper takes 0.04 second to record. Therefore — there are 5 small boxes in each large box. Figure-2: Use of ECG Grid Paper to measure PR and QRS intervals. Each small box on ECG grid paper — takes 0.04 second to record; each large box — takes 0.20 second to record. There are 5 small boxes in 1 large box. It takes 1.0 second to record 5 large boxes (0.20 sec X 5 = 1.0 second). NOTE: Both the PR interval and QRS interval on the right in this Figure appear to be prolonged. (Figure reproduced from A 1st Book on ECGs-2014 — Page 62). The PR Interval: What is Long? What is Short? For practical purposes — the PR interval in adults should normally not be more than 1 large box (0.20 second) in duration. IF the PR interval clearly exceeds 1 large box in duration — then there is 1st Degree AV Block (Figure-3). Figure-3: Comparison of a normal vs a long PR interval. For practical purposes — the PR interval is long IF it clearly measures more than 1 large box in duration (Figure reproduced from A 1st Book on ECGs-2014 — Page 64). Clinical NOTES: Precise measurement of a PR interval that is normal is not important. What counts is recognizing when the PR interval is prolonged. The norms for intervals are different in children. Young children have smaller hearts than adults. As a result — it may take less time for the impulse to travel through the smaller heart of a young child compared to the time for the impulse to travel through the heart of an adult. Normal measurements for PR and QRS interval duration may therefore be somewhat less in children compared to adults. BOTTOM Line: Be Aware that ECG assessment of a pediatric patient is different than in an adult. That said —We focus attention in this Blog post on ECG standards for adults. In addition to an upper normal limit for PR interval duration — the PR interval may also be too short (ie, less than 0.12 second in duration). The principal clinical entity in which this happens is WPW (Wolff-Parkinson-White) Syndrome. Physiologically — most of the time that makes up the normal 0.12-to-0.20 second duration of the PR interval is spent trying to get through the AV Node. The reason the PR interval is shorter-than-expected (ie, less than 0.12 second) with WPW — is that a special conduction pathway exists that bypasses the AV Node. This results in much faster conduction of the impulse to the ventricles — with resultant shortening of the PR interval. What IF the PR Interval is Long? In summary, IF the PR interval is long (ie, clearly more than 1 large box in duration) — then 1st Degree AV (Atrio-Ventricular) Block is said to be present. Each P wave on the tracing is still conducted to the ventricles. It is just that it takes a little bit longer to get there (Figure-4). There are 3 degrees of AV block. Of these 3 degrees — 1st Degree AV Block (as diagnosed by the presence of a prolonged PR interval that is greater than 1 large box in duration) — is the mildest form. The clinical course of 1st Degree AV Block as an isolated defect is usually benign — and, most often no specific treatment is needed. Details of more advanced forms of AV Block (ie, 2nd or 3rd Degree, and “high-grade” AV Block) extend beyond the scope of this post. Pacing may or may not be needed (depending on hemodynamic stability of the patient, severity of the AV block — and other clinical factors). Figure-4: Sinus Rhythm with 1st Degree AV Block. Each P wave is conducted to the ventricles (as conveyed by the constant PR interval). It’s just that it takes a little longer for each P wave to conduct (Figure reproduced from A 1st Book on ECGs-2014 — Page 66). QRS Duration: When is the QRS Wide? In adults — Conduction through the ventricles should normally not take more than 0.10 second. Remember: It takes 0.20 second to record each large box on ECG grid paper (Figure-2). It therefore takes half this amount (= 0.10 second) to record half a large box. For practical purposes — the QRS is “wide” IF it is clearly more than half a large box (= greater than 0.10 second) on ECG grid paper (Figure-5). NOTE: Precise measurement of the QRS complex is not necessary. That is — it does not matter IF the QRS is 0.08 second, 0.09 second, or 0.099 second. All that counts — is whether the QRS complex is of normal duration or prolonged. The “beauty” of this general rule — is that it allows you to tell in an instant IF the QRS is normal or wide. This is evident for the Sinus Rhythm at the bottom of Figure-5. The QRS complex is clearly a bit more than half a large box in duration. Therefore — the QRS is wide. There is no “lower limit” of normal for QRS duration. Clinically — We only care IF the QRS is normal or prolonged. Advanced Point: The reason we favor a definition of ≥0.11 second (rather than ≥0.12 second) as “wide” for QRS duration — is that both RBBB and certain forms of VT may occur with no more than this slight amount of QRS prolongation. An extra advantage is that it is easy to tell at a glance IF the QRS is wide using this definition — simply by looking to see IF the QRS is more than half a large box in duration. 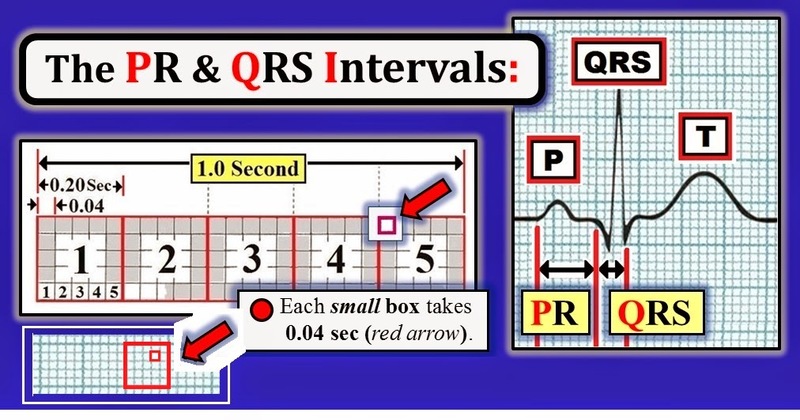 Figure-5: For practical purposes — the QRS is “wide” IF it is clearly more than half a large box in duration (= greater than 0.10 second). Sinus Rhythm is present in the lead II rhythm strip at the bottom of this Figure (the red arrow highlighting the upright sinus P wave). The PR interval in this tracing is normal (ie, not more than 1 large box in duration) but — the QRS complex is “wide”. We say this because the QRS complex is a little bit wider than half a large box in duration (ie, the QRS is >0.10 second). (Figure reproduced from A 1st Book on ECGs-2014 — Page 67). Looking Closely: Is the QRS Wide? By way of comparison — We show what a normal vs a wide QRS complex looks like in Figure-6. Although admittedly subtle — the QRS complex on the right (green circle) is clearly a little bit more than half a large box in duration. Therefore — the QRS on the right (green circle) is wide. Figure-6: Comparison of a normal vs a wide QRS complex (Figure reproduced from A 1st Book on ECGs-2014 — Page 68). 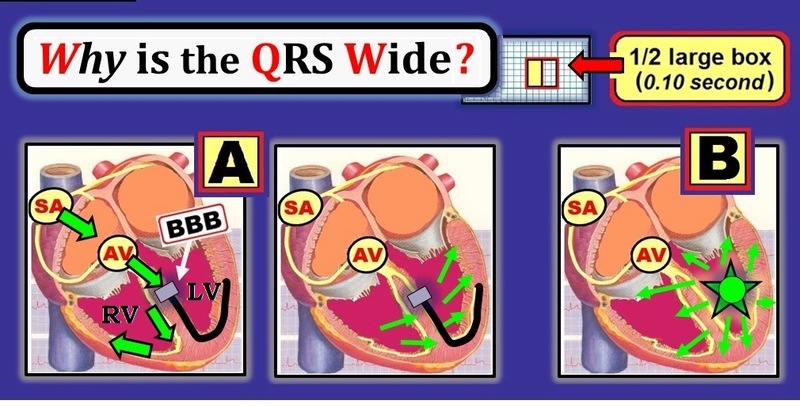 What IF the QRS Complex is Wide? IF the QRS is wide (ie, clearly more than half a large box in duration) — it is most often due to one of 2 Reasons: i) There is a problem with conduction of the impulse below the AV Node — which most often reflects either Right or Left Bundle Branch Block (= failed conduction at either Point 3 or Point 4 in Figure-1); — or — ii) The impulse is arising from the Ventricles rather than from the SA Node. NOTE: Other causes of QRS widening are possible but less common (ie, drug overdose, hyperkalemia, Wolff-Parkinson-White Syndrome, aberrant conduction). Alternatively — there may be a nonspecific pattern of QRS widening during sinus rhythm due to scarring of heart tissue or cell death (from previous myocardial infarction or cardiomyopathy). This nonspecific pattern is known as IVCD (IntraVentricular Conduction Defect). BOTTOM Line: Although there are other causes of QRS widening during sinus rhythm — for practical purposes (and for purposes of this 1st Book on ECGs) — IF the QRS complex is wide — Think first about: i) BBB (Bundle Branch Block) or ii) a ventricular rhythm. TEST YOURSELF: Why is the QRS Complex Wide? It is usually easy to tell IF the rhythm is sinus with QRS widening from preexisting BBB (Bundle Branch Block) — vs QRS widening because the origin of the rhythm is from the ventricles instead of the sinus node. Consider the 2 short rhythm strips shown in Figure-7. In each case — the QRS complex is wide (ie, more than half a large box in duration). What is the reason for QRS widening in Panel A and Panel B of this Figure? Figure-7: What is the reason for QRS widening in Panel A and Panel B of this Figure? (Figure reproduced from A 1st Book on ECGs-2014 — Page 69). ANSWER to Figure-7: The rhythm is regular in each of the 2 short rhythm strips shown in this Figure. In each case — the QRS complex is wide (ie, clearly more than half a large box in duration). Tracing A (in Figure-7) — There is Sinus Rhythm, because each QRS is preceded by an upright P wave with fixed PR interval in Lead II (red arrow in Panel A). The reason the QRS complex is wide is BBB (Bundle Branch Block). As schematically shown below in Figure-8 — conduction is fast (larger green arrows) until the block (BBB) is reached. Because of the block — activation of one ventricle is much slower (smaller green arrows). In Tracing B — there is no P wave (blue arrow in Panel B of Figure-7). This tells us that the rhythm in Panel B is not sinus — but instead begins in the Ventricles. NOTE: We do not discuss the intricacies of distinguishing between RBBB vs LBBB (Right vs Left Bundle Branch Block) in this post — nor do we discuss differentiation between BBB vs more nonspecific forms of conduction disturbance (such as IVCD). These entities extend beyond the scope of our discussion in this Blog post. For our purposes here — it suffices to recognize: i) IF and when the QRS complex is wide; and ii) When the QRS is wide — WHY is it wide (conduction defect or ventricular rhythm — as shown in Figure-8)? We will discuss distinction between RBBB, LBBB, IVCD and WPW (as reasons for QRS widening) in a future post. Figure-8: For practical purposes, IF the QRS complex is wide — it is most often due to either: i) BBB (Bundle Branch Block) or ii) a ventricular rhythm. In Panel A — the rhythm is sinus with QRS widening due to preexisting BBB (corresponding to Tracing A in Figure-7). In Panel B — the rhythm begins in the ventricles. As a result — no sinus P wave is seen on the ECG (corresponding to Tracing B in Figure-7). (Figure reproduced from A 1st Book on ECGs-2014 — Page 70). The QT Interval: Is the QT Normal or Long? Physiologically — the QT Interval consists of the time period from the beginning of ventricular depolarization — until the end of ventricular repolarization. On the ECG — this period extends from the onset of the QRS until the end of the T wave. For practical purposes, the QT is prolonged — IF it clearly measures more than half the R-R interval. This relationship is easily seen in Figure-9. Figure-9: The “eyeball” method for assessment of the QT interval. Normally — the QT should not be more than half the R-R interval (left in Figure). The QT interval in the middle is of borderline duration. The QT on the right is clearly prolonged (Figure reproduced from A 1st Book on ECGs-2014 — Page 84). Determination of whether the QT interval is normal or long is clearly more difficult at fast heart rates. Therefore, when heart rate is significantly over 100/minute — it may not be worthwhile spending time trying to assess the QT interval. Similarly — QRS widening may also lengthen the QT. This limits what can be learned from assessing the QT when there is bundle branch block. BUT — when heart rate is not overly fast (ie, less than 90-100/minute) — and the QRS complex is not wide — the simple rule shown in Figure-9 can very quickly tell you IF the QT is normal or not: The QT is prolonged — IF it measures more than half the R-R interval. Why Care if the QT is Prolonged? From a clinical perspective — We want to know IF the QT is normal or long. This is because the presence of a long QT predisposes the patient to a potentially life-threatening form of ventricular tachycardia known as Torsades de Pointes. IF the QT is long (but the QRS complex is of normal duration) — Consider the likely causes. The Common Causes of a Long QT when the QRS is of normal duration are: i) Certain Drugs (and combinations of drugs); ii) Low K+/Mg++ (= low potassium or magnesium); and/or iii) a Neurologic “catastrophe” (ie, stroke, seizure, coma, head trauma, bleeding into the brain). TEST YOURSELF on Intervals: Is the QT Normal? We do not need to precisely measure the PR and QRS intervals (Because of the small size of the grid — we could not do this even if we wanted to). Instead — it suffices to simply state IF the PR and QRS is normal or long. Measure the QT where you can clearly see it — and in the lead(s) where it looks to be longest? Figure-10: Interpret this ECG for the 3 ECG intervals. Are the PR, QRS and QT intervals normal? (Figure reproduced from A 1st Book on ECGs-2014 — Page 85). ANSWER to Figure-10: In the absence of a long-lead rhythm strip — We begin our interpretation by looking at Lead II. Although there are only 3 beats in lead II — the upright P wave with fixed PR interval (green arrow in lead II — that occurs just before the 3rd QRS complex in this lead) — tells us there is Sinus Rhythm. Brief perusal of other leads from this 12-lead ECG confirms that the overall rhythm is regular. The rate of the rhythm is ~100/minute (the R-R interval is ~3 large boxes — and 300/3 ~100/minute = Sinus Tachycardia). The PR Interval is normal (ie, not more than 1 large box in duration). 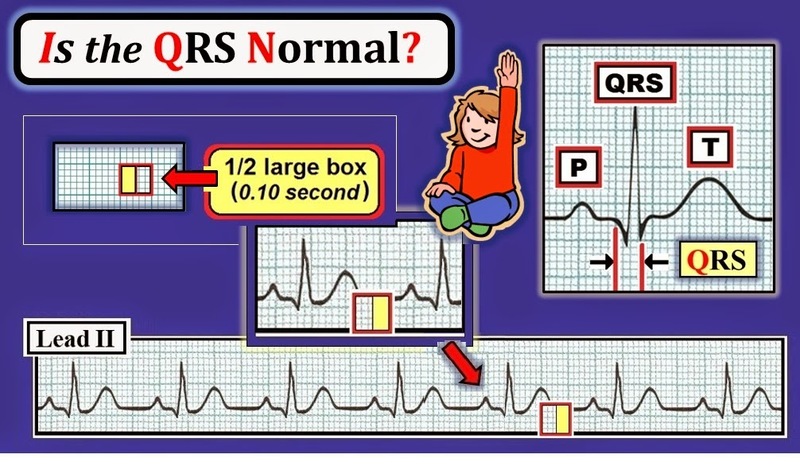 The QRS is narrow = of normal duration (ie, not more than 1/2 a large box). The QT Interval is long (ie, clearly more than 1/2 the R-R interval in the lead V2 blow-up). Which Lead to Use to Measure Intervals? Assessment of each ECG interval should be done in a lead where the limits of the interval can be clearly seen and, in which the interval appears longest. Most of the time we measure the PR interval in lead II — since this is the lead in which P waves are usually seen best (as well as being the lead used to define Sinus Rhythm). 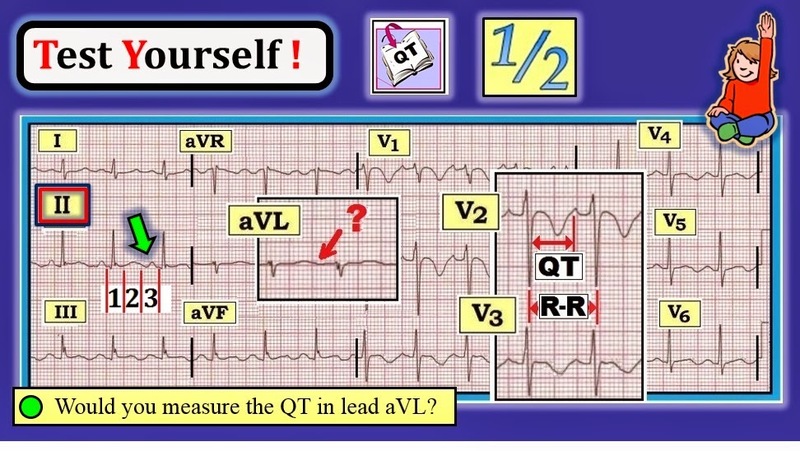 But — We look at all 12 leads when deciding which lead(s) to use to measure the QRS or QT intervals. For example — We would not use a lead like aVL to assess the QT interval in Figure 10 — because it is virtually impossible to know where the low amplitude T wave in this lead ends (red question mark). However, there is no doubt from selecting lead V2 or V3 — that the QT interval in Figure-10 is prolonged! We conclude this post on the basic features of the 3 ECG Intervals with a memory aid — that will hopefully facilitate recall of the upper limits of normal for each Intervals (Figure-11). Simply — Think of the Numbers “1” & “2”. The PR Interval is long — IF it measures more than 1 large box in duration. The QRS is wide — IF it measures more than 1/2 a large box in duration. The QT is long — IF it measures more than 1/2 the R-R interval. Figure-11: Memory aid using the numbers “1” and “2” — to facilitate recall of the upper limits of normal for each of the 3 ECG intervals (Figure reproduced from A 1st Book on ECGs-2014 — Page 86). Material for virtually all Figures and content is excerpted from our newest publication = “A 1st Book on ECGs-2014”. The expanded ePub version of this book is out in Kindle-I-Books-Kobo-Nook! Because we are not limited by space constraints of a hard copy book — explanations are enhanced and our discussions are more-in-depth in the ePub version. Please check out Free Download of our expanded GLOSSARY of ECG-related terms. For a LINKED INDEX of our ECG Blogs by Topic — CLICK HERE !!! Just out! - 118 pages - ALL in COLOR - for the Beginner! I assume NO prior knowledge about ECGs. GO TO - www.ecg1stbook.com - - - - - Expanded ePub is OUT in Kindle-Kobo-Nook- and also in -iBooks! Review of fundamentals - excerpted from "A 1st Book on ECGs" (EASY Link: www.basicsecg.com). ECG-2014-ePub is out in I-Books - Kindle - Nook - Kobo. Search in the respective Store for, "grauer ecg" - and it should come right up. Our greatly expanded ePub version is OUT in Kindle-Kobo-Nook-iBooks! ECG Competency: I've added a Timed-Link CONTENTS to allow Fast-Forward on the Resident Instruction & ADMIN Videos. Arrhythmia Mgmt: I've added a Timed-Link CONTENTS to allow Fast-Forward to specific topics in this 3-Part Arrhythmia Video. 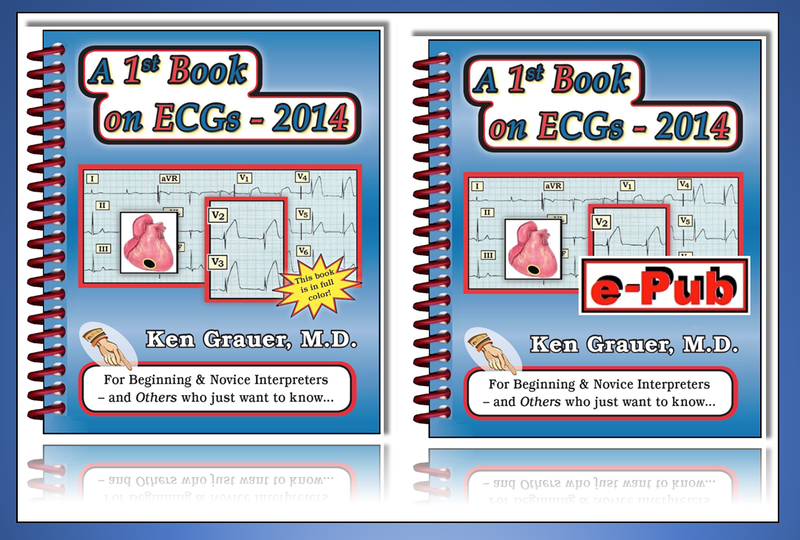 The NEW enhanced ECG-2014-Pocket Brain (260 pages). The ePub version (above) has LOTS more content! A greatly enhanced and expanded version of ACLS-2013 is now out in ePub (nook-kindle-ibooks-kobo)! The NEW 5th Editions of ACLS-2013-Pocket Brain and ACLS: Practice Code Scenarios are out! - Video #7: Wide Tachycardia - VT? - Check out ECG Video-Blog-2 !!! - Check out ECG Video-Blog 13 ! 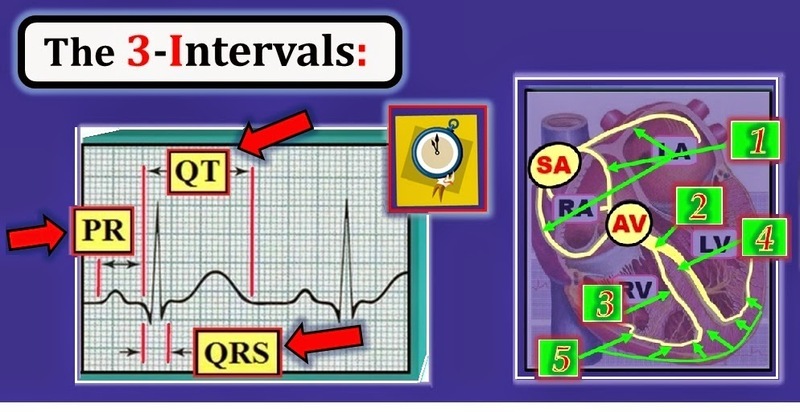 - Check out ECG Video-3 ! - Check out ECG Video-Blog 3 ! - Check out ECG Video-Blog 7 ! - Check out ECG Video-Blog 8 ! - ARVC -or- ARVD - coming soon! 2010 to present by ECG Interpretation. Powered by Blogger.